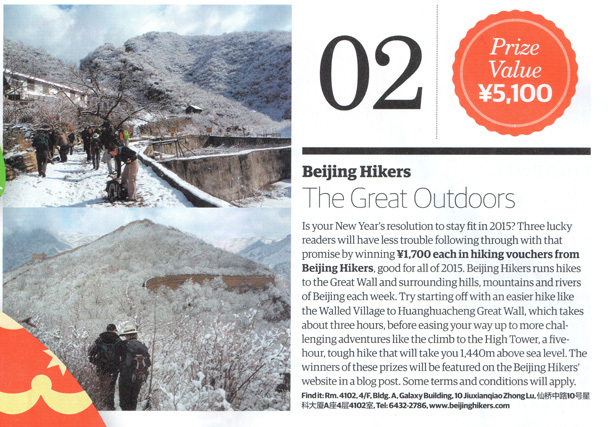 In Brief: Win 1,700 RMB of hiking vouchers in the City Weekend magazine Christmas Gift Extravaganza. We've contributed a whole heap of hiking vouchers to City Weekend magazine's Christmas gift extravaganza, and you can try to get your hands on them by clicking through to the City Weekend website and answering a not-so-simple question: "Besides hiking, what's your favorite way of experiencing the great outdoors in and around Beijing, and why?" Link: Win Beijing Hikers hiking vouchers. Answers are due before December 15. Good luck!